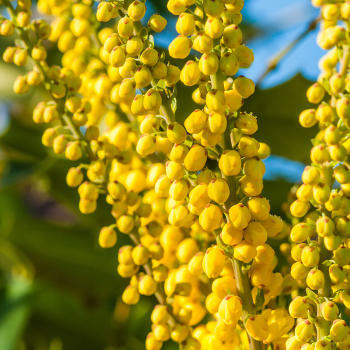 Deliciously fragrant and rich in honeybee nectar, the numerous little lemon yellow mahonia flowers extend into long bunches for weeks on end, from December to April. Small blue-black berries form after this blooming. Shiny, thorny, dark green leathery leaves with a yellow-green underside make evergreen mahonia extremely ornamental. Leaf veins stand out on the reverse side of the leaves. Young leaves unfurl with a beautiful bronze-colored hue. For a more spectacular impact, plant three specimens together. Near the house, it will shine its light during gray days and you’ll savor its fragrance. In a shade bed, it will settle in well with its neighbors if they also share its preference for shade and slightly acidic soil. 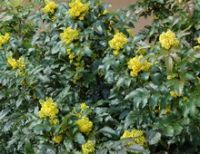 Mahonia loves temperate climate with mild winters, high moisture during the summer and soil abundantly amended with humus. 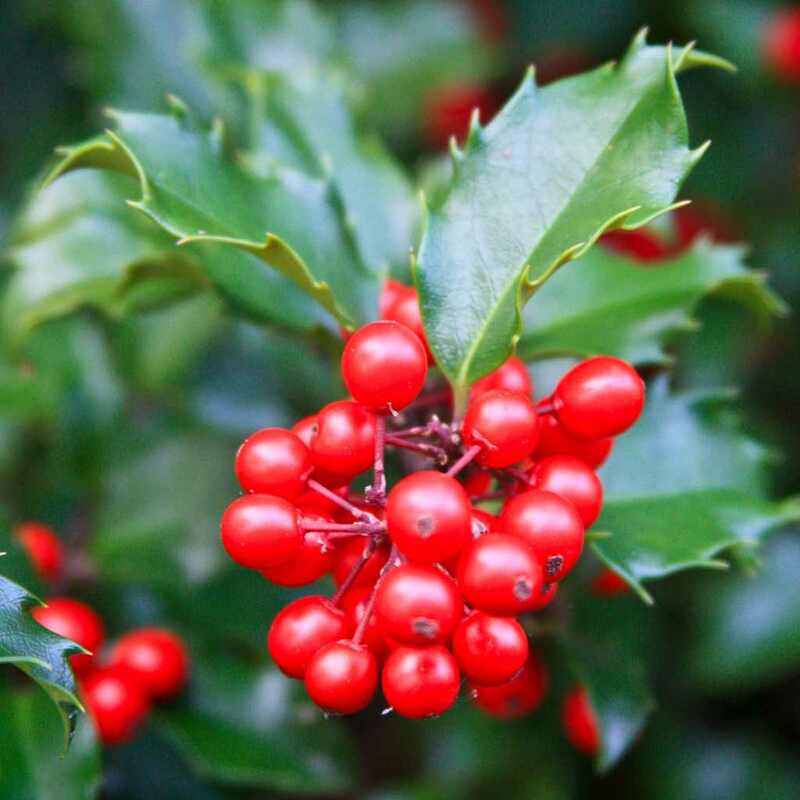 It fears brisk cold spells and excessive changes in temperature, violent winds and dry soil in summer. Although it tolerates a wide range of soil types, it favors rather sandy soil that is either neutral or slightly acidic, and amended with a lot of humus before planting. Adding organic soil conditioner made from manure and seaweed is highly recommended. In very chalky soil, you’ll have to add blond peat or heath soil to make the soil more acidic. Plant preferably between October and March-April. 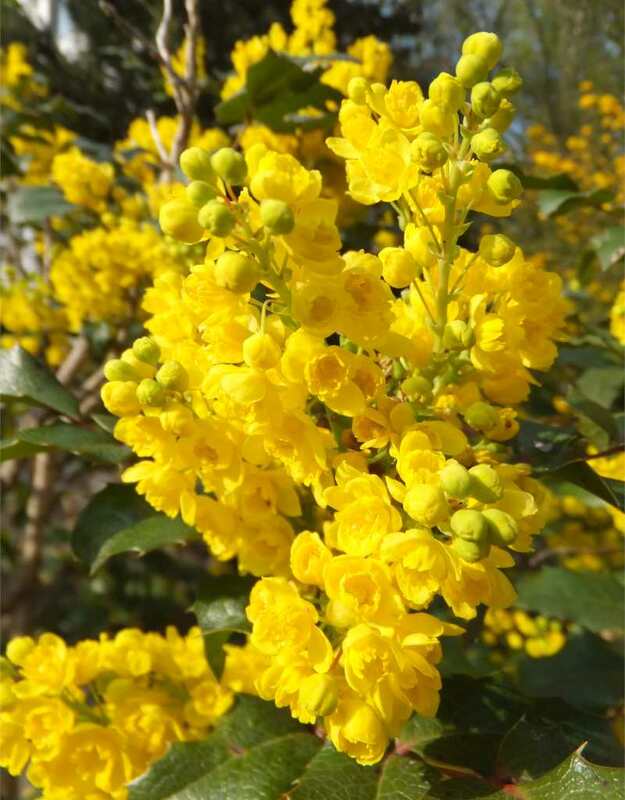 Mahonia are always sold with their root clump in containers, which guarantees that they’ll settle in for sure. Planting distance: on average 5 feet (1.5 meters). Its growth is quite slow, more or less 8 inches (20 cm) a year. Adult shrubs grow 6 to 10 feet (2 to 3 meters) tall, but some exceptional specimens tower at over 16 feet (5 meters). Young specimens need to be staked because the stems are sometimes too frail to carry the huge bunches of flowers and leaves without bending over. It is also mandatory to prune them after the blooming, so that the stem may branch out: pinch off the apical leaf bunch to eliminate it. Once it has grown, mahonia doesn’t require any pruning anymore. Simply remove damaged or dried up branches and eliminate wilted floral scapes. Water regularly enough that the soil stays moist during the entire first year of growing. Mulch helps protect roots from freezing in case of intense cold. Compost or tree bark will provide humus while keeping the soil cool and hindering the spread of weeds.